If I ask my boys to tell me a story, it usually involves a nail-biting finish to a football grand final (the winning goal kicked by the story teller of course). My daughter is all about a ballerina fairy princess, cleverly combining all her interests into one marvellous character. Whilst I love hearing football and princess stories, I also love hearing my kids reminisce about things they have done and creating their own ‘family urban myths’. Knowing that everyone has a story, the designers behind the beautiful Leaf Journals have created Story Starter – a simple collections of cards with various themes and prompts that help get your story started. Your story can be real or imagined and there are lots of ways to use the cards, from taking turns to choosing starter cards or telling a story around the same theme. 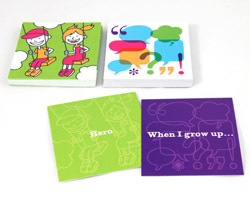 Story Starter cards are great for travel, campfire chats and rainy days. They may also help with the homework next time your child is ‘stuck for ideas’. The cards are aimed at children seven years and older although younger children can manage them if used informally. 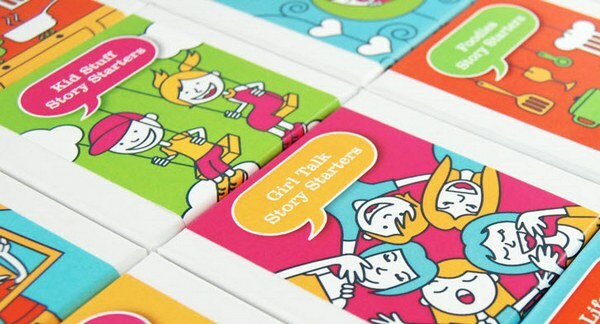 There are also Story Starter sets about Little Tackers (so that you can talk about your kids) and Girl Talk, which I think I need for my next mother’s group weekend away. Story Starter cards are $19.95 each and are available directly from Leaf Journals.